The World is Abound with Conflict – What Should the U.S. Do? A bloody war is being waged between Israel and Hamas. In-fighting between factions of militants is tearing apart a once-stable Libya. The MH17 disaster illuminated - and worsened - the ongoing conflict between Russia and Ukraine. ISIS is wreaking havoc throughout Iraq and Syria. The Middle East is historically a conflict-prone region, and few could claim post-Soviet relations between Russians and Ukrainians have been rosy. Yet, today, the world feels like it is aflame with conflict, violence and discord. "The concentration we're seeing now is really unprecedented," Bobby Ghosh, managing editor of Quartz, said on "New Day" Monday. "John Kerry is the busiest man in the whole wide world." 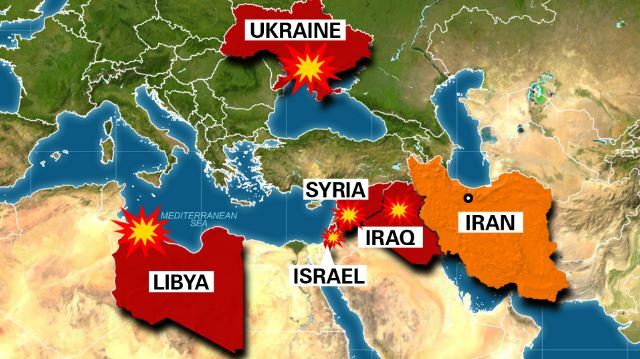 Ghosh and CNN's John Berman mapped out some of the simmering battles throughout the Middle East and Eastern Europe, and Ghosh assessed whether the United States can - or should - intervene. Thunderstorms in Southern California caused injuries and a death on Sunday due to lightning. Several people were taken to the hospital after a lightning bolt struck in Venice Beach during the afternoon. An unusual shift in monsoonal moisture brought storms to the region and impacted the beaches of the area. CNN's Indra Petersons explained the events of the dangerous weather. Rice 'Punishment': What is NFL Thinking? Carol Costello anchors the 9 a.m. to 11 a.m. ET edition of CNN's "Newsroom" each weekday. The opinions expressed in this commentary are solely those of the author. He believed that because men were physically stronger and mentally tougher, men had the obligation to shield women from harm. I didn't buy the mentally tougher part, but I did embrace the idea that men were born with a kind of wonderful genetic code that made it impossible for them to pummel any woman, least of all a woman they cherished. I believed this all the way through grade school and high school. I believed it until my college boyfriend, in a jealous rage, threw me against the wall and knocked me out. It only happened once, but I remember how it felt. I always thought I was a physically strong woman, but I could not defend myself against a man who outweighed me by 70 pounds. Which brings me to star running back Ray Rice. When video emerged of the Baltimore Ravens player dragging his unconscious fiancée from an elevator, I thought the whole world would be horrified. I thought the National Football League would come down hard on Rice. Rice will sit out two games and pay a fine. It reportedly will cost the multimillionaire athlete $529,411.24. Plus, come on! The guy went to counseling and married his victim, for goodness sake. In a wonderfully headlined post, "The NFL Thinks Smoking Weed Is Eight Times Worse Than Beating a Woman Unconscious," the website sports.mic contrasted Rice's situation with that of Josh Gordon, a wide receiver for the Cleveland Browns, who "is facing a 16-game suspension ... for testing positive for marijuana ..."
Actually this strange kind of "justice" meted out by NFL Commissioner Roger Goodell doesn't bother me as much as what the Ravens posted on their Twitter feed. According to whoever tweets for the Ravens, Janay Rice herself "deeply regrets the role she played the night of the incident." Perhaps the new Mrs. Rice really does feel that way, but the Ravens' "helpful" tweet is as tone deaf as John Harbaugh's Rice "made a mistake/he's a heck of a guy" comment. Ayonna Johnson, director of legal services for the Women's Resource Center to End Domestic Violence, says, "When it comes to ... professional sports, unfortunately we're still in a male-dominant society." A girlfriend or a wife, she says, "has to bend themselves down, bend herself lower, and make her partner and her love interest shine a little brighter." Even when her manly, wealthy, successful husband is clearly wrong. Put more bluntly, take the blame, Honey, you probably deserved it. I don't say that lightly. After my boyfriend knocked me out, I expected my friends to rally around me. Most did not. "He's such a nice guy," they told me in disbelief. "You must have made him really mad. You say some mean stuff. He really loves you." ESPN's Stephen Smith played the role of my callous former friends on his show, "First Take." He assured his audience that, PERSONALLY, "as a man raised by women," he knows full well there's never an "excuse to put your hands on a woman," except, that is, when you must. Smith blathered, "We also have to make sure that we learn as much as we can about elements of provocation." In other words, Ladies, don't provoke your man or he'll deck you. Smith's colleague - and my new hero - Michelle Beadle tweeted, "I'm thinking about wearing a miniskirt this weekend ... I'd hate to think what I'd be asking for by doing so." Smith tried to apologize, but the damage was done. Perhaps the NFL will try to apologize too, but again, the damage is done. So, Mr. Goodell, a few facts for you to ponder for the future: According to safehorizon.org, one in four women will experience domestic violence during her lifetime. One-third of female homicide victims are killed by their current or former partner. According to the Coalition Against Domestic Violence, boys who witness domestic abuse are twice as likely to abuse their own partners and children when they become adults. It's why I thank God every day I married a man whose father was as old-fashioned as mine. Gordon Snyder taught his sons a slightly different version, though. Gordy said, "A man who hits a woman never hits a man." Are you listening, Mr. Goodell? A central goal of Israel's military action in Gaza is to destroy tunnels used by Hamas to smuggle weapons and launch attacks. Yigal Palmor, a spokesman for the Israeli Foreign Ministry, spoke to CNN's Kate Bolduan Monday and said they have uncovered some 36 tunnels crossing from Gaza into southern Israel. "The IDF has now destroyed approximately 16 or 17 tunnels at this moment and they are continuing their operations to blow up and destroy other tunnels," Palmor said. "We know that Hamas has used them on various occasions and has planned on using them again for major territory attacks on communities in the south of Israel and, therefore, it is essential that we destroy all of them." Meanwhile, chief Palestinian negotiator Saeb Erekat was asked on the show what he believes the tunnels are for. "I know the situation is so much complex - I'm not saying I know the picture as a whole," he responded. But, he said, Gaza is now like a burning building. "We need to get the people out, and then we need to extinguish the fire, and then we sit down and talk." RELATED: What is Israel's endgame in Gaza? RELATED: What is Hamas' endgame in Gaza?